You can’t drive around without auto insurance — this includes here in the greater Ottawa area, and in many other places around the world. Well, you can try to drive around as an uninsured driver. Sure, your car will still operate all the same, but you’re seriously setting yourself (and other drivers that you encounter on the road) up for a disservice. Not only is it illegal and unlawful to operate a motor vehicle without the proper Ottawa auto insurance coverage, but it’s going to leave you and your vehicle without any sort of financial protection in the event of an accident. So, seeing as car insurance is absolutely mandatory, you might find yourself shopping around for a well-valued auto insurance policy in anticipation of getting that sweet new ride that you’ve always dreamed of owning. Whether it’s a beefy muscle car, a massive pick up truck, or a top-end minivan with all of the bells and whistles to wow the kids, insuring a new car is no inexpensive ordeal — so you’ll want to make sure that you’re getting the right policy right off the bat…or perhaps, right off of the starting line, if you will. Not An Insurance Expert? No Worries. Bradley’s Insurance Is Here To Help! As the preferred insurance brokers in Ottawa, the brilliance of working with Bradley’s Insurance to find you the ideal auto insurance policy is exactly that — we’ll help you find a policy! After all, that’s our job as insurance brokers, not your job. Get in touch with us today to get started. 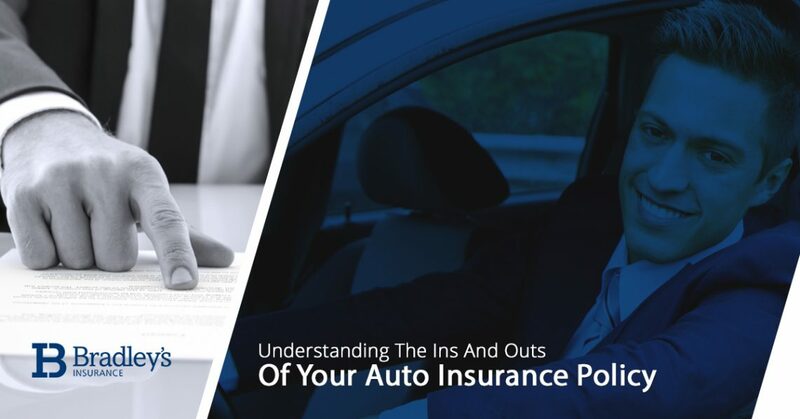 To help make your auto insurance quest easier, read below to learn more about what goes into your policy. High-Level: What Does Auto Insurance Do For Me? Fair question — we might as well start out with the basics. Broadly speaking, all insurance services provide a certain level of protection to consumers by covering certain every day (or specialized) risks and promising to pay for any financial losses associated (or more accurately, caused by) those risks. As one of the most popular and common forms of personal insurance, auto insurance protects you, your vehicle, and other drivers (and their vehicles) in the way of medical bills and repair costs. Granted, auto insurance policies are extremely common because most states down south, as well as provinces here in Canada, require that your vehicle has at least basic auto insurance coverage. You can think of auto insurance in two major parts: liability insurance and property damage coverage. Typically, most auto insurance providers will then split the liability component of auto insurance up into three distinct (but major) parts: liability insurance for bodily injury, uninsured or underinsured motorists coverage, and liability insurance for property damage. As you can most likely decipher, bodily injury liability coverage protects you against the injured party’s claims when the accident was your fault. This typically covers items like medical expenses, lost wages, and the pain and suffering associated with the accident. Quantifying the former is easier said than done, but appraisal experts will determine this. If you caused any damage to other people’s property, this component of liability insurance would protect you. Naturally, this includes damage to other people’s vehicles involved in the accident, but also extends to other property like walls, fences, and equipment. Keep in mind that uninsured motorist coverage, in most cases, directly protects the policyholder themselves. In order words, if you were to be hit (and consequently injured) by a hit-and-run driver who does not have auto insurance (perhaps the hit-and-run makes more sense when you consider their lack of coverage), you would still be covered. You’ll also want to keep in mind that there is a difference between property damage liability insurance and property damage coverage. Typically, property damage includes (or may include) both collision coverage as well as comprehensive coverage, though this is not always the case. As far as the physical damage to your vehicle is concerned, this will be paid out via collision coverage. To be clear, collision coverage will pay for the damage to your vehicle if it collided with another object such as a fire hydrant, tree, or automobile. Though generally optional and not required by law, collision coverage may be required if you lease a brand new vehicle or get a loan from a particular lending company. You’re probably familiar with the term “totaled” or “totaling” as it pertains to the value of your vehicle (or another valuable object). With older vehicles, if the cost of repairing the vehicle exceeds the value or worth of the vehicle, it is considered “totaled” by your auto insurance provider. In the case of a total, you’ll simply get paid out what your vehicle was worth as opposed to getting it fixed. This part of an auto insurance policy will protect you from things like fire, severe weather, vandalism, floods, and theft. Broken glass from windshield damage is also covered. We understand that insurance-related matters can be confusing. That’s why we’re Ottawa’s dedicated auto insurance policy navigators! Don’t work with an insurance broker that doesn’t consider your needs and situation. Bradley’s Insurance will personally work with you until we find the right auto insurance solution that fits your needs. Get started today!